Tethys - Solar System Planets And Moons Section. Tethys has a density similar to water. International Space Station Crew Named. This is an image of impact crater Hale, which is located in the Argyle basin in the southern hemisphere of Mars. The photograph was taken by the European Space Agency's Mars Express spacecraft in June 2004. The crater and surrounding region have been heavily eroded over millions of years by a combination of wind and water. There is even evidence at the bottom of the picture of a network of fluvial channels, which were probably caused by running water. Saturn's moons, Titan and Tethys. Cassini's image team has released two new photographs taken by the spacecraft that show two of Saturn's moons in unprecedented detail: Titan and Tethys. The picture of fog enshrouded Titan is actually a mosaic of 9 individual images stitched together that were taken as Cassini approached. The photograph of Tethys is actually in natural colour, and shows how neutral the Moon looks. Tethys has a density similar to water, so scientists believe the Moon is mainly composed of water ice. 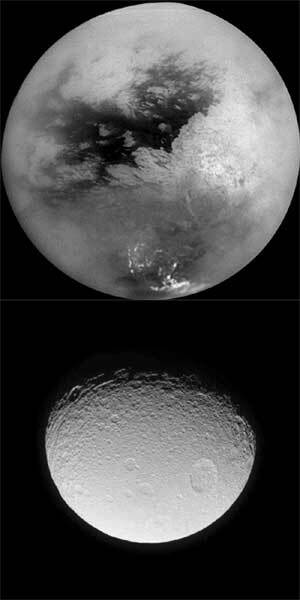 Cassini will make a much closer approach to Tethys in September 2005.